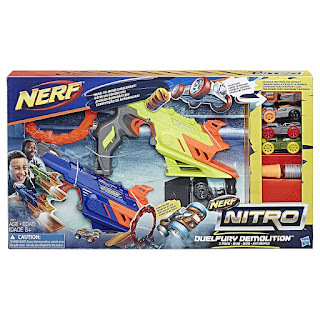 Head over to get this Nerf Nitro DuelFury Demolition for ONLY $24.14 (Retail $39.99)! Blast into overdrive with Nerf Nitro sets! Kids can create awesome stunts as they fire foam cars from blasters that feature the power and performance of the Nerf brand! Blast into stunts to go high, go far, go fast! Unleash car-blasting action with the Nerf Nitro DuelFury Demolition set. Challenge friends in head-to-head stunt competitions with the rings of fire, long-jump ramps, and obstacles! Includes 4 foam cars.